In December 2012 Richard Howard sent the following message seeking information about brewers in the area. If anyone has information for Richard please contact the site. Back in 2008 I carried out some research on ‘brewing’ in Masham and came across Henry Lofthus (Lofthouse) who I had identified as a brewer. Henry was listed many times in connection with various inns where he provided surety to a number of innkeepers seeking to hold a licence or renewing their licence and he indicates in certain records his trade as a brewer. I have continued, from time to time, to make inquiries about the ‘brewers’ of Masham and would appreciate any further information you may have. Richard Howard. As an extension to the interest in Brewers of Masham, it is interesting to note the Pubs and Victuallers in Masham and surrounding area. Baines Directory 1822 directory Peter Barker. at the Black Bull. Masham Thomas Handley. at the George & Dragon. Masham John Lightfoot. at the Kings Head. Masham. Henry Lofthouse. at the Lord Nelson. Masham. Robert Welford. at the Royal Oak, Masham. George Ascough. at the Wheat Sheaf, Masham. Anthony Gill. at the White Bear, Masham. William Cartwright. at the Black Swan, Grewelthorpe. William Jackson. at the Kings Head, Grewelthorpe. Thomas Jackson. at the Wheel, Grewelthorpe. Robert Metcalfe. at the Board, Grewelthorpe. Robert Ascough. at the Queens Head, Kirkby Malzeard. Sarah Musgrave. at the Board, Kirkby Malzeard. William Scavers. at the Golden Lion, Kirkby Malzeard. Thomas Thorpe. at the Shoulder of Mutton. Kirkby Malzeard. In 1837 Francis Atkinson was an Innkeeper in Grewelthorpe. [Ref. Yorks. Gazette 1837] In 1851 The following people were linked to the brewing industry in Grewelthorpe. Thomas Spence. – Innkeeper. Matthew Jackson – Publican. Robert Auton. – Victualler.In 1853. Reported that John Bray – landlord at Royal Oak Inn Grewelthorpe. In 1857. Reported that Robert Shaw was innkeeper at Grewelthorpe. In 1861 the following people were linked to brewing industry in Grewelthorpe. Thomas Spence – Innkeeper. Mary Jackson. – Publican. In 1871 the following people were linked to the brewing industry in Masham. Joseph Mallaby. Innkeeper at Bay Horse Inn. Richard Trevor. Brewers Labourer. John Cundall. Brewers Labourer living Blackbull Yard. Thomas Wilson. Innkeeper Bruce Arms. John Garner. Brewers Labourer Blackbull. William Mason. Brewers Clerk. Living Silver Street. Robert Theakston. Brewer living Silver Street. Thomas & Robert Theakston. Brewers. sons of above. James S Smith. Brewer living Silver Street. John Gatenby. Brewers Labourer living Quaker Terrace. Charles Johnson. Innkeeper on Silver Street. Thomas Welsford. Cellarman. Across of the Hill. John Robinson. Brewers Labourer. Across of the Hill. Thomas Scurrah. Brewers Labourer. Cross of the Hill. Trevor Hall. Brewers Labourer. Cross of the Hill. William Smith. Nightman in Brewery. Thomas Lightfoot. Brewer employing 24 men. Bank Villa. Innkeepers in Grewelthorpe in 1891. Richard Frankland. Crown Inn. Jane Kipling. Royal Oak. Innkeepers & workers Kirkby Malzeard in 1891. William Richmond. Shoulder of Mutton. Kirkby Malzeard. Elizabeth Richmond. Barmaid. Shoulder of Mutton. William Moore. Licensed Victualler Henry Jenkins Inn. Maggie Moore. Barmaid at Henry Jenkins Inn. Innkeepers in 1891 in Grantley. George Calvert. Black-a-Moor Inn. Innkeeper in 1901 Grantley. John Fryer. Black-a-Moor Inn. At the Brewster Sessions for the liberty of Ripon in 1894. The license for the Bay Horse Inn Grewelthorpe was transferred to James Crabtree from his late wife. The license for the Hackfall Inn Grewelthorpe was transferred to John Crabtree. In 1901 The following people were linked to the brewing industry in Masham. Thomas Theakston. Brewer. Living Bell Field House. Robert Theakston. Brewer Living Bell Field. Edwin Theakston. Brewer Living Bell Field. Thomas Broadley. Brewer. living Masham. Peter Mallaby. Brewer’s Drayman. Francis Sickling. Brewer’s Carter. Charles Lumley. Brewer’s Waggoner. John Scarth. Brewer’s Cooper. Thomas Scarth. Brewer’s Clerk. Joseph Clark. Brewer’s Labourer. George Inns. Brewer’s Labourer. William Smith. Brewer’s Labourer. Inn keepers in Masham 1901. James Wilson. Old Market Place. Masham.Robert Broadley. Silver Street. Masham.John W. Hartley. Silver Street Masham. Silver Street Masham. 1908. Memories of Masham from Paul Theakston. The Bay Horse Inn would then likely belong to T & R Theakston Ltd, which became a limited company in 1905. Now, 2012, the pub belongs to Greene King plc. The chimney in the background belongs to Lightfoot’s Brewery, Wellgarth Masham. The same scene today still has the chimney, but reduced by the top section, taken down before the 39/45 War. Halfway along Silver Street to the left, obscured by buildings, was the Bull Inn, no longer a pub in 1908, but the origin of Theakston’s Brewery (which was behind it) up the small narrow street, still known locally today as’The Bull’. The cellars for the pub still extend under Silver Street through to the right hand side. 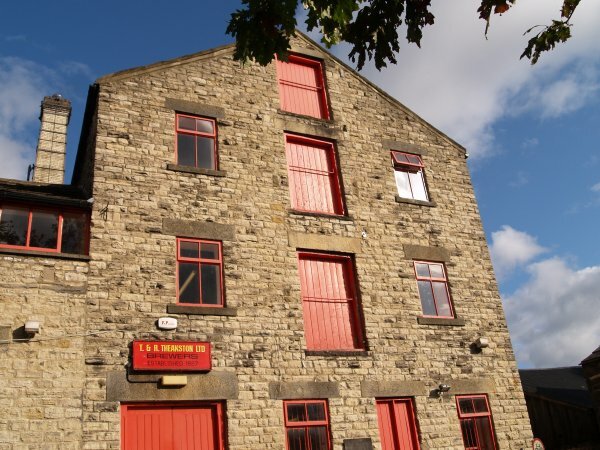 The Theakston family acquired the lease of the The Bull Inn and its brewery in 1827, the start of the Theakston family brewing dynasty. Innkeepers in Grewelthorpe 1901.William Morley. Crown Hotel. Butcher & Innkeeper. John Crabtree. Hackfall Inn. Innkeeper. John Feather. Royal Oak Inn. Innkeeper. This license was not renewed in 1915. Innkeepers in Kirkby Malzeard 1901. John Cockshott. Queens head Hotel. Innkeeper Frederick Cockshott. Apprentice Barman.Minnie Iddison. Barmaid. William Walker. Shoulder of Mutton. Publican. Margaret Moore. Henry Jenkins Inn. Innkeeper. Innkeepers in Dallowgill & Laverton 1901. John Thirkill & Jane. Drovers Inn. Publican & Farmer. John Wright & Margaret. Shooters Inn .Tom Corner. Publican & Farmer. George Metcalfe. Hope Inn Laverton. Publican Manager. Drovers Inn Dallowgill. Destroyed by fire in 2013. William Thackrey. Crown Hotel. Butcher & Innkeeper. 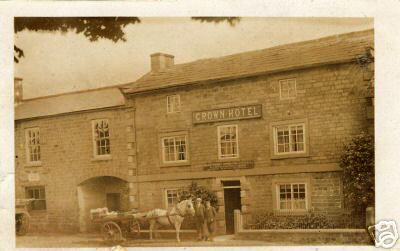 Landlords of The Crown Inn [Crown Hotel] Grewelthorpe. 1851/1861 – Thomas Spence. 1872. John Wright. 1881 – Margaret Wright [widow]. 1891 – Richard Frankland. 1901 – William Morley. 1911 – William Thackrey. 1915/1929 – John Cookshaw 1936 – Isaac Morley. 1949 – Frederick John Atkinson. 1970/71 – G.Oliver. Landlords of Hackfall Inn Grewelthorpe. 1949 – Oliver Bernard Dawson. People involved in the brewing industry in Masham taken from the 1939 registry. Robert Theakstone. Managing Director of Brewery. Living Bellfield. Edwin Theakstone. Brewery Director. Living White Bear Hotel. Herbert Scaife. Malt Brewster. Living Crosshills. Tom Morton. Maltster. Living Marfield Terrace. Roland Walls. Brewers Traveller. Living 2 Wellgarth. Robert Raw. Brewers Motor Driver. Living 1 Wellgarth. Stuart Forbes. Motor Driver Malt roasting. Living 1 Wellgarth. John Scott. Maltster. Living Broadview. James Leathley. Roast Maltster. Living Masham. Edwin Simmonds. Sen. Maltster. Living Silver Street. Edwin Simmonds. Jun.. Maltster Living Silver Street. William Moon. Brewer. Living Park Square. James Skirrow. Brewers Assistant. Living Park Street. William Binks. Brewers wagon driver. Living Park Street. Harry Lockwood. Maltster. Living Masham. Raymond Burton. Malt Roaster & Blacksmith. Living Station Cottage. Walter Bruce. Maltster. Living Morton Row. John Lambert. Brewery Cooper. Living Swinton Terrace. John Peacock. Brewery cellarman. Living Thorpe Rd. Charles Peacock. Maltster. Living Thorpe Rd. George Anson. Maltsters clerk. Living Rodney Terrace. Henry Binks. Brewery drayman. Living Almshouses. Ernest Mudd. Maltster. Living Masham. John Mudd. [age 16] Brewers Bottle washer. Living Masham. Charlotte Wilson. Proprietress of Bay Horse Inn. Francis Bell. Publican. Bruce Arms. Grey Sherwood. Hotel Proprieter. Kings Head Hotel. Frederick W. Ingram. Innkeeper at Kings Head Inn at Fearby Cross in 1939.